Come aboard our custom built 40' Custom Sportfishing Convertible fishing boat, powered with twin 300hp diesels that will take you to the where the fish of lore are found. 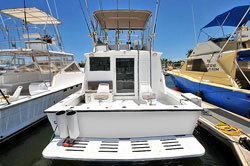 Enjoy lots of room to fish on deck and up on the bow. This beauty is extra-wide and provides great stability and room to land fish. Get together with 10 of your best fishermen and head out to the big game fishing grounds for marlin, sailfish and tuna visit the most famous fishing grounds in all of Puerto Vallarta, including El Morro & Marietas (8 hour trips), Corbetena (10 hour trips) and El Banco (12 hour trips). See More. There is a 25 Pesos (About $1.50 USD) Per Person Marina Entrance Fee in Marina Los Peines, Puerto Vallarta.